The director general of Nigeria’s National Broadcasting Commission (NBC) has sanctioned four major TV stations for airing politicians’ speeches deemed hateful or dangerous. 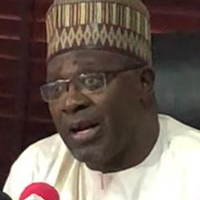 Mallam Is’haq Modibbo Kawu announced the news at the NBC’s headquarters in Abuja last week during a press conference about Nigeria’s 2019 general election. The offending broadcasters are the Nigerian Television Authority (NTA), African Independent Television (AIT), Channels TV and Television Continental (TVC). Kawu said all four had violated the NBC’s code, which states that political broadcasts shall be in decent language and that live coverage shall be truthful, decent and fair. The sanctions relate to speeches made by politicians from both the ruling All Progressives Congress (APC) and the main opposition, the People’s Democratic Party (PDP). “Broadcasters have huge responsibility of protecting and guiding our democracy, and we have a huge responsibility of ensuring we don’t promote violence or anything that can lead to it,” said Kawu, adding that radio stations were also being sanctioned.